The creation of the INA Historical Archive is closely linked to the 50th anniversary of the Institute itself. 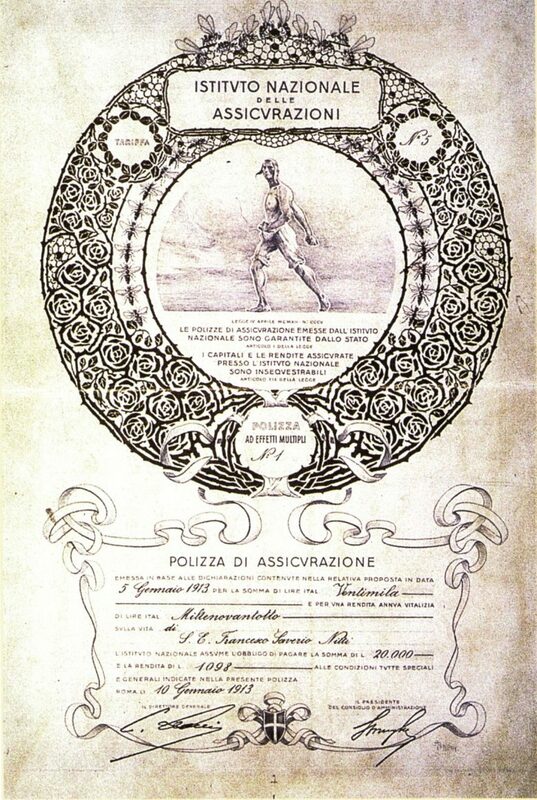 On 27 April 1961, with this important occasion approaching, the session of the Board of Directors of the public body founded by Giolitti in 1912 resolves a series of cultural initiatives including the establishment of a Historical Archive to preserve “documents, sketches for propaganda reproduction, prints, photographs, letters, reports, publications, monographs, films, memoirs, and whatever else can have content or significance relevant for the history of the Institute“. In 1966, as per internal memorandum no. 1362 of 7 February, the Historical Archive becomes an office placed under the Press and Propaganda Department; its main purpose is to continue the retrieval of documentation useful for historical reconstruction. In 1987, during INA’s 75th anniversary celebrations, the Historical Archive still represents an important factor of identity and cultural policy factor, as then chairman Antonio Longo recalls when presenting the inventory of papers of his distant predecessor, Bonaldo Stringher: “Having a Historical Archive has become a programmatic point for large enterprises, which is also a factor of identity (…) carrying out systematic action of retrieval and appraisal of the documentation present at different levels of the company structure, organising a Historical Archive to receive and manage it, making an inventory of documents (…): these are different moments in the archival policy in place at INA“. In the 1990s, after the transformation of INA into a joint-stock company together with other privatisations of companies such as ENEL, ENI and IRI, and after the Archival Superintendency for Lazio in 1993 declared the Institute’s entire archive historical in 1993, the Historical Archive also acquires a new function within the company’s document workflow. In fact, following a major survey project among the archives of all departments carried out for the Institute by the Study Centre for Corporate Historical and Economic Documentation, a records schedule is drafted up in which the Historical Archive is indicated as central to both retention and disposal of papers, and this function is brought to the attention of all management staff under internal memorandum no. 2100 of 15 July 1996 where it is recalled how “as part of the Documentation Service [is] operating the management function of the Historical Archive, which deals with the necessary activities of retrieval, appraisal and classification of documents. All Company Departments should address this function in order to obtain certain indications – through the application of the Documents Retention and Disposal Schedule – for the weeding of paper documentation as well as for the proper keeping of current archives and storage“. In the early 2000s, the Historical Archive regains the possession of the archival fonds of INA’s real estate department, after this business branch had been alienated to another company in 1998, which has become the Historical Real Estate Fonds. These holdings are of great interest since the Institute has built or purchased property in almost every provincial capital; among the building works, it is sufficient to recall the buildings in Rome in Via della Conciliazione and Corso del Rinascimento. The INA Historical Archive takes the name of INA-Assitalia following the merger in 2006 of INA SpA and Assitalia – Le Assicurazioni SpA, the historical insurance company for the operation of the non-life business founded in 1923 with the help of the Institute, whose documentary heritage was declared to be of considerable historical interest in 2000. It is also worth recalling that over the course of time other insurance companies controlled by the Institute, such as Fiumeter (formerly Fiume e Terra) and Praevidentia, were transferred to Assitalia.